The consumer electronics giant was the Dow's biggest mover on a trading day marked by big stock swings. 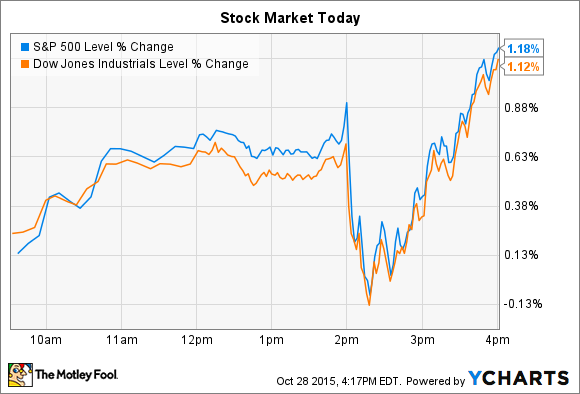 Stocks had a volatile day today but mustered a strong rally into the close. The S&P 500 (SNPINDEX:^GSPC) and Dow Jones Industrial Average (DJINDICES:^DJI) both ended at session highs, rising by more than 1%. But it wasn't a steady climb throughout the day. Stocks sunk into the red immediately after the Federal Reserve issued its policy statement at 2 pm EDT. That announcement kept interest rates near zero, but hinted that the first rate hike in nine years could come in December. The central bank said officials are assessing a "wide range of information" on employment, inflation, and international developments as they consider whether to raise rates at the Fed's next meeting, scheduled to end on Dec. 16 . Meanwhile, Apple (NASDAQ:AAPL) and Akamai Technologies (NASDAQ:AKAM) both made major moves today in the wake of their third-quarter earnings reports. Apple's stock rose 4% to become the Dow's biggest percentage gainer today. Investors liked what they saw from the consumer electronics giant's fiscal fourth quarter results that were released after the closing bell last night. And for good reason. Apple sold 22% more iPhones this quarter and collected 36% higher revenue on those sales, leading to an industry-crushing average selling price of $670 – compared to $603 in the year ago period. That ASP improvement came despite major foreign currency pressures that lopped eight percentage points off of reported sales growth. Apple revealed several other encouraging data points on its business, including huge revenue gains in China (+99%), continued market share improvement for the Mac (+14%), and massive cash returns to shareholders ($13 billion of stock buybacks). Looking ahead, CEO Tim Cook and his executive team sounded optimistic about the holiday quarter, which could be among the best three-month performances of any business in history. Apple guided for revenue of $76.5 billion and gross margin as high as 40%. High expectations for the iPhone 6s and 6s Plus are the foundation for that bullishness. Cook said in a conference call that the 6s models should significantly outperform their predecessors this year thanks to several tailwinds. Those include a fast-growing China market, a surge of people switching from Android devices, and a large current customer base that's itching to upgrade from their older iPhone models. "We feel like we have a very open field in front of us," Cook said in last night's conference call . Content delivery network operator Akamai Technologies plunged 17% after posting its third-quarter results, but there wasn't anything surprising about the headline figures. In fact, Akamai met Wall Street's 11% sales growth target while beating profit expectations. However, the company issued a weak outlook for the fourth quarter. In a conference call with investors, executives said that revenue should tick higher by just 8% in the fourth quarter – or half the company's recent growth pace. That figure was significantly below analysts' expectations. Akamai cited several reasons for the expected drop off, but the biggest one was a decline in traffic growth for some of its largest media accounts. And to make matters worse, these customers, and others, are working on their own content delivery solutions that aim to take Akamai out of the picture in some cases. Management warned that they see the traffic growth issue continuing on into 2016, but they believe the "do-it-yourself" strategies won't kill Akamai's long-term potential for data delivery. "We remain bullish on the medium to long-term growth prospects for the potential for an increase in the amount of video traffic that could move online. [Media] traffic is much more difficult to serve at quality and scale and therefore not subject to the same do-it-yourself activity you see for less performance sensitive areas like software downloads," Chief Financial Officer James Benson said. But investors apparently weren't reassured by that statement, and today's sell off reflects worries that Akamai could struggle with slower traffic growth for some time.